The term penny stock has evolved with the market. In the past, penny stocks were stocks that traded for less than a dollar per share. The SEC, however, has modified the definition to include all shares trading below $5. The market for penny stocks can be traced back to the scrum of stock brokers who used to trade stock shares that weren’t at all welcome on the New York Stock Exchange. A 1920 finance article in Munsey’s magazine called penny stock brokers “a close-packed mass of creatures apparently human” and described the auctioning of shares in a puppy. Penny stocks are often stated as risky investments that hardly pay off. Admittedly, there is fact to this, but with the right knowledge and tactics, it is possible to earn a significant amount of gain in penny stocks. Simply said, a penny stock is an equity that trades at a low price. Irrespective of the name, penny stocks usually are priced over a penny, occupying a price range at or close to $1, though some are priced a fraction of a penny. Often referred to as micro-cap equities, the Securities & Exchange Commission classifies these types of securities as being $5 or less. Over-the-counter stocks are NOT listed on any of the formal exchanges. Most penny stocks don’t trade on the major market exchanges. However, there are some large companies, based on market capitalization, that trade below $5 per share on the main exchanges like the Nasdaq. Penny shares can be listed on NASDAQ or other known stock exchanges, although many more cannot be found there. A major percentage of penny stocks are listed on the so-named ‘pink sheets’, i.e., daily news of OTC shares. They can even be seen on the ‘Over-the-Counter Bulletin Board.’ Commodities listed on the OTCBB fail to fulfill the listing guidelines of the NYSE or other known exchanges, although they are mandated to file financial statements with known regulators, such as the SEC. Penny shares are inexpensive, thus attractive to shareholders who lack the funds to buy comparatively expensive blue-chip stocks from large firms. 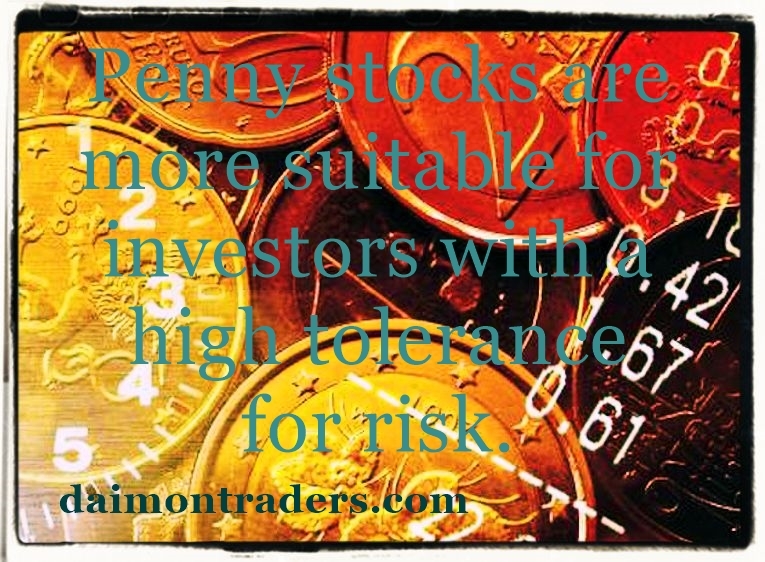 Penny stocks are more suitable for investors with a high tolerance for risk. Typically, penny stocks have a higher level of volatility, resulting in a higher potential reward and a higher level of risk. Considering the heightened risk levels associated with investing in penny stocks, investors should take particular precautions. For example, an investor should have a stop-loss order predetermined before entering the trade, knowing where to exit if the market moves opposite of the intended direction. Although penny stocks can have explosive moves, it is important to have realistic expectations. Typically, gains in the stock market take months and years to materialize. An investor who buys penny stocks with the intention of turning $100 into $50,000 over a week is likely to be deeply disappointed. Penny stocks are often growing companies with limited cash and resources. In other words, most penny stocks are high-risk investments with low trading volumes. Penny stocks are considered highly speculative investments. In order to protect the investor’s interest, the SEC and the Financial Industry Regulatory Authority (FINRA) have specific rules to regulate the sale of penny stocks. All broker-dealers need to comply with the requirements of Section 15(h) of the Securities Exchange Act of 1934 and the accompanying rules to be eligible to effect any transactions in penny stocks. Penny stocks can be traded after hours. In fact, many of the largest market movements, both on the national public exchanges and on penny stock exchanges, happen after hours. Penny stocks are traded on listing services such as OTCBB and Pink Sheets. For after-hours trading of penny stocks, an investor would purchase those shares through a normal brokerage service, much like investing in traditional public securities. Since a lot of market movements happen after exchanges close, penny stocks are subject to volatile fluctuations after hours. If penny stock investors execute buy or sell trades after hours, they may able to sell shares for very high prices or purchase shares for very low prices. Four major factors make these securities riskier than blue chip stocks. Many of the companies considered to be micro-cap stocks are either newly formed or approaching bankruptcy. These companies will generally have poor track records or none at all. As you can imagine, this lack of historical information makes it difficult to determine a stock’s potential. When stocks don’t have much liquidity, two problems arise: first, there is the possibility that you won’t be able to sell the stock. If there is a low level of liquidity, it may be hard to find a buyer for a particular stock, and you may be required to lower your price until it is considered attractive to another buyer. Second, low liquidity levels provide opportunities for some traders to manipulate stock prices, which is done in many different ways—the easiest is to buy large amounts of stock, hype it up and then sell it after other investors find it attractive (also known as pump and dump). How is a Penny Stock Created? Stocks on the OTCBB and pink sheets do not have to fulfill minimum standard requirements to remain on the exchange. Sometimes, this is why the stock is on one of these exchanges. Once a company can no longer maintain its position on one of the major exchanges, the company moves to one of these smaller exchanges. While the OTCBB does require companies to file timely documents with the SEC, the pink sheets have no such requirement. Minimum standards act as a safety cushion for some investors and as a benchmark for some companies. Penny stocks investments have always been seen as a disreputable sector of the stock market. Many listings are totally bogus. Most penny stocks are, at best, just some guy with an idea, and usually that idea is to raise money to pad his own pockets. Other penny stock listing are failing businesses that got dropped from the major exchanges because they’re on the brink of failure. A shady trader can simply buy large sums of shares, temporarily leading up the price, crafting artificial demand. Penny stocks boast immense profit potential. Because these stocks trade cheap, even a slight jump in price turns to be profitable. Look out, however, because frequently shareholders may have trouble getting a decent amount of details about penny stocks. These kinds of shares tend to be latest in news, with almost no track record for investors research. In addition, penny stocks show lack of market activity, with poor liquidity, making them difficult to sell. Poor liquidity results in penny stocks to be open to price influence. Novavax, Inc. is a clinical-stage vaccine company focused on the discovery, development and commercialization of recombinant nanoparticle vaccines and adjuvants. The Company operates through developing recombinant vaccines segment. The Company, through its recombinant nanoparticle vaccine technology, produces vaccine candidates to respond to both known and newly emerging diseases. The Company’s product pipeline focuses on a range of infectious diseases with vaccine candidates in clinical development for respiratory syncytial virus (RSV), seasonal influenza, pandemic influenza and the Ebola virus (EBOV). The Company’s lead adjuvant for human applications, Matrix-M, is in a Phase I/II clinical trial for pandemic influenza H7N9 vaccine candidate. It is also testing Matrix-M in conjunction with its EBOV vaccine candidate in a Phase I clinical trial. It is developing additional pre-clinical stage programs in a range of infectious diseases, including Middle East respiratory syndrome (MERS). Ability Inc. is a holding company. The Company operates through its subsidiaries, Ability Computer & Software Industries Ltd. and Ability Security Systems Ltd., which provide interception, geolocation and cyber intelligence tools for security and intelligence agencies, military forces, law enforcement agencies and homeland security agencies around the world. The Company is engaged in off-air interception of voice, short message service (SMS), and data communication from both cellular and satellite communication networks, and deciphering solutions for both cellular and satellite communications. The Company’s product categories include Cellular Interception, Cellular Counter Interception, Satellite Interception, Geolocation, Cyber and Crime Prevention. Its Cellular Interception systems include Ultimate Interceptor (ULIN), IBIS, TouchDown, ACIS, AGIS-51 and 3G-Cat. Its Satellite Interception systems include IRIS, ATIS and SLIS. Pizza Inn Inc. operates a chain of buffet style pizza restaurant and delivery/carry out style restaurants and express restaurants. As of June 2010, Pizza Inn owned 312 restaurants both domestically and internationally. In the last 12 months, PZZI stock has climbed 22%, and the chain is up 19% since the start of 2011. Looking at its last income statement, the company posted quarterly earnings growth of 22% and quarterly revenue growth of 5%. PZZI is trading just below its 52-week high of $2.41, and should be considered by penny stock investors and pizza enthusiasts alike. Envoy Capital Group Inc. Envoy Capital Group Inc. (NASDAQ: ECGI ), is an international consumer and retail branding company, and a merchant banking and financial services company. This penny stock is one of the biggest gainers on our list, rising 110% in the past six months. Looking in the shorter term, this penny stock has gained 19% in the last 30 days. Buy this penny stock now as it trades below its 52-week high of $2.18. International casino entertainment company Century Casinos Inc. (NASDAQ: CNTY ) has gained 19% since last June. Century Casinos develops and operates gaming establishments and related lodging and restaurant facilities in parts of Canada and Colorado. Last quarter, the gaming company posted quarterly revenue growth of 21%, year-over-year. Concerning earnings, analysts are expecting CNTY to post an EPS of three cents this quarter, compared to last year when the company just broke even. Add in last quarter’s quarterly of earnings growth of 180%, year-over-year, and CNTY is a penny stock worth buying.